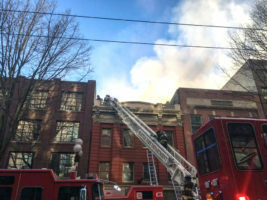 A fire on First Avenue in downtown Seattle closed that road to traffic in both directions Thursday afternoon. Firefighters were sent at 2:34 p.m. to the blaze in the 1900 block of First Avenue. The building on fire was the historic Butterworth Building, built in 1910. It’s located within the Pike Place Market historic zone. It now houses the popular Irish bar, Kells. The fire was reportedly extinguished at 3:48 p.m. No injuries were reported. The Seattle Department of Transportation reports that the fire response blocked off the avenue near Stewart Street. The road remained closed as of 4:40 p.m., according to SDOT. The Butterworth Building is rumored to be haunted and was formerly a mortuary. David Zarett, who owns the adjacent Alaska Trade Building and also owned the Butterworth Building from 2001 to 2005, said his building was evacuated to escape the incoming smoke coming from its neighbor. He said that Kells likely sustained heavy damage in the blaze. This was the second incident to tie-up downtown Seattle traffic Thursday. An earlier crash between three vehicles and a pedestrian sent one patient to the hospital with critical injuries.